There are a lot of impressive yachts in the world. To buy a ‘small’ one can cost millions, and owning one represents absolute freedom and attainment of the highest degrees of wealth. Superyachts, by definition, are over 24 meters long, but some are much longer – and though size does matter, most are ultimately defined by their exquisite design, luxurious facilities and expensive price-tag. What better place to start than by Sailing Yacht A? This world famous yacht is one of the largest boats of its kind at 469ft. It has a hybrid powerplant propulsion system powering its engines, and is supported by a three-mast fore-and-aft sailing. This boat can reach speeds of 21 knots, or 16 knots whilst cruising. A large underwater observation pool is one of its neatest rumoured features. Sailing Yacht A was built by Nobiskrug for Russian billionaire Andrey Melnichenko. As if owning one superyacht wasn’t enough, the same billionaire also owns another of the world’s greatest boats, Motor Yacht A. 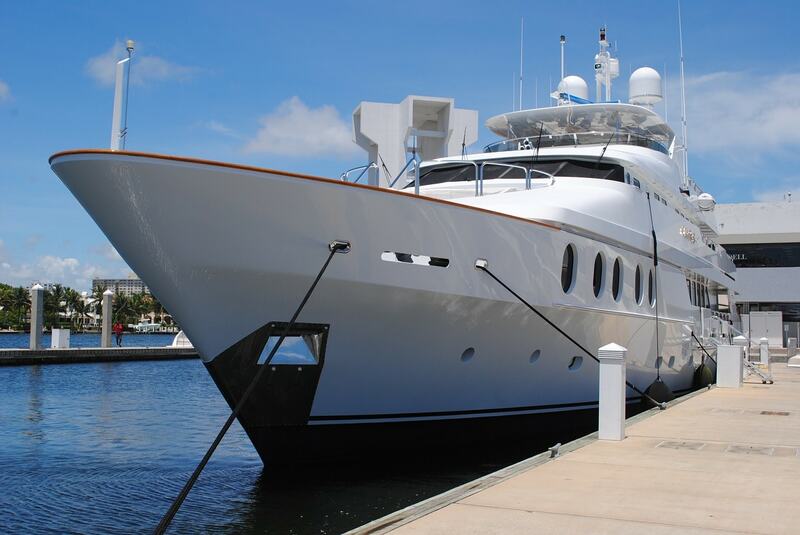 This 390ft vessel has eight floors, the master bedroom is 153 sqm, while the total space is 233 sqm. It is designed for 14 guests and 35 crew members.. Motor Yacht A is immense, and its beautiful interior (designed by Phillipe Starck, who is also responsible for the plush interior of Sailing Yacht A) made from precious metals even features secret rooms, moving walls and air-tight security features. Melnichenko reportedly collected the $450 million-commissioned Sailing Yacht A in Monaco, on 4th May. Sailing Yacht A and Motor Yacht A, collectively worth nearly a billion dollars, were both parked up in the same dock during the PokerStars Championship that was taking place that day at the Casino de Monte Carlo. Poker players and holiday makers alike were treated to the spectacle as the two impressive superyachts stood side-by-side in the harbor. 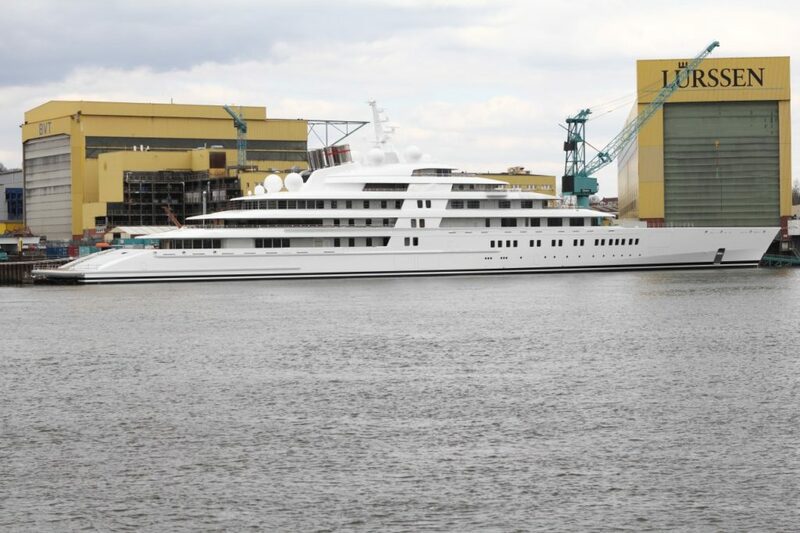 The biggest private superyacht in the world is the Azzam, built by Lurssen and designed by Nauta Yachts for the United Arab Emirates President at a cost of around $605 million. Azzam is an impressive 590ft long, yet two gas turbines and two diesel engines give it the power (94,000hp) and design to travel at over 30-40 knots in warm and shallow water, making it not only the largest in the world but also one of the fastest. If you think that’s fast for a superyacht (which it is! ), then consider that the speediest yachts in the world can travel at over 70 knots. The fastest on record so far is Fonars, built in Spain in 2000, which uses a triple water jet propulsion system powered by three Rolls Royce engines and two MAN engines. Though nearly half of the world’s Superyachts are owned by Americans, our final selection is another that is owned by a Russian. Billionaire investor Roman Abramovich is, naturally, the proud owner of the Eclipse, a $350 million yacht made by Blohm and Voss. It is 536ft long, has 24 cabins to accommodate guests in luxury, swimming pools, disco halls, hot tubs, helipads, launch boats and its own submarine, as well as an anti-paparazzi defense system designed to blur any attempts to take photos. Pretty awesome stuff! It’s an inspiration to see superyachts of this caliber, even if they do cost an absolute fortune. Working on one would be the job of a lifetime and these kinds of yachts do tend to have large crews, so there are increased opportunities to get a job onboard one of the world’s most impressive superyachts.